Award-winning personalised chocolate bars for every occasion! 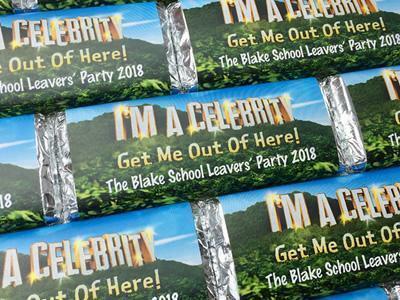 Whether it's a birthday, wedding, corporate event or special occasion, WrapperStar specialises in creating personalised chocolate bar favours that will add the perfect finishing touch to your celebrations. All special occasions deserve to be personalised without it costing you the earth, & without you being restricted to a certain space or number of letters for personalisation. We design stunning & affordable edible favours to match your party theme, wedding stationery, or incorporate a special photo or logo...to say exactly what it is you want to say. 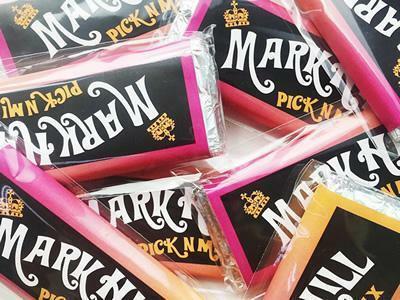 You can even inject more fun into your event with our WrapperStar Wonka bars. Provide your own artwork or allow us to create something for you. 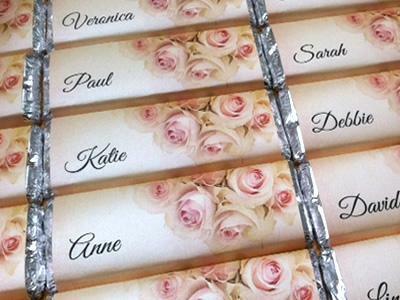 The possibilities for your personalised chocolate bars are endless! With over a decade's experience in this industry, we LOVE what we do & are committed to exceeding expectations; providing the highest levels of customer service to our customers throughout the UK & Europe. Making the world a happier place, one personalised chocolate bar at a time! Yet again fantastic service from Ally at Wrapperstar, the chocolate bars just added that little extra to our Christmas party bags. We will be using Wrapperstar again and again another reason for a party! Great communication from Ally from start to finish. Her knowledge and passion helped us to create a personal, unique and fun wedding favour for our guests to enjoy. And boy they did. Not only did they look great but they tasted good too! I absolutely love my favours and found Ally a pleasure to work with. She was so friendly and really passionate about getting the order just right. Nothing was too much trouble and I am sure our guests are going to be over the moon on the wedding day. Ally was the most attentive of all the wedding suppliers I am currently dealing with. Ally was a total professional! What a wonderful idea this was. Ally was a total professional, and provided a very fast service. I ordered Wonka chocolate bars with a golden ticket inside for my 40th birthday celebrations and they have gone down a treat. We have had so many wonderful comments on how great they are. Thank you so much Ally, I would absolutely recommend to anyone! I would definitely use again and recommend to friends! Received the chocolates safe & well. They are perfect, just what I was looking for. A fast reliable service and one I would definitely use again and recommend to friends. Before finding WrapperStar I had spent hours searching the internet for my wedding favours. One phone call to Ally and I had the chocolate bars that matched my theme. I cannot thank you enough. Ally displays enthusiasm and genuine excitement! Ally displays enthusiasm and genuine excitement for her products and is full of good ideas for how her product can enhance - whether it's a wedding favour or a business give away. We need more people like Ally driving SME business in the UK.